Chicago, IL (November 28, 2018) – Last night, the U.S. House of Representatives passed the U.S. Coast Guard Authorization Act of 2017, which includes the Vessel Incidental Discharge Act (VIDA). The legislation will change how ballast water and incidental discharges from ships are regulated. Ballast water discharged from ocean-going ships is the most common pathway for aquatic invasive species to enter the lakes. And vessels that operate solely within the Great Lakes, known as Lakers, move aquatic invasive species around the lakes once they arrive. Previous versions of VIDA, championed by the shipping industry, would have significantly weakened ballast water regulations. The version of the bill passed by the House and Senate includes several important improvements that protect the Great Lakes, including the continued regulation of ballast water and incidental discharges under the Clean Water Act. However, the bill preempts states from adopting standards that are stronger than federal law, which in the past has been an important tool for states in the Great Lakes region. Current regulations and state rules will remain in place until the new federal rules are implemented under this legislation. The same legislation was passed by the U.S. Senate on November 14 and the bill now moves to the White House for the President’s signature. “Last night’s vote by the U.S. House of Representatives on the U.S. Coast Guard Authorization Act of 2017, which included the Vessel Incidental Discharge Act (VIDA), was the culmination of years of discussion and debate on ballast water regulations. Ballast water discharged from ships is the primary pathway for new aquatic invasive species to enter the Great Lakes. These harmful critters have caused significant ecological damage to the lakes and cost Great Lakes communities more than $200 million each year. The shipping industry’s proposals included in prior versions of VIDA would have significantly weakened ballast water regulations and put the Great Lakes at risk. Great Lakes champions in Congress worked tirelessly to substantially improve the bill and protect the lakes. 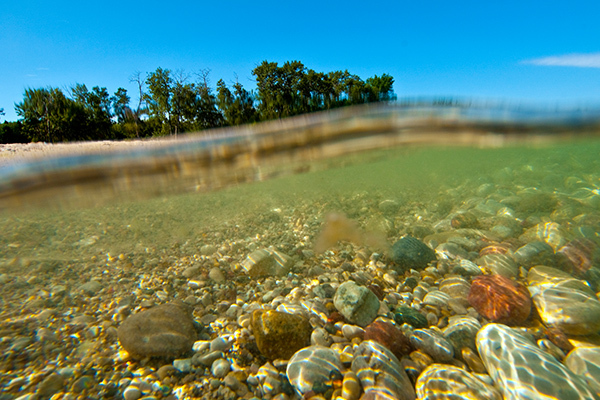 We applaud their work to protect the Great Lakes.